KANSAS CITY, Kan. (Feb. 4, 2019) – Legends Outlets Kansas City continues to expand its dining category with the exciting new addition of El Toro Loco Mexican Bar & Grill. Locally owned and operated, El Toro Loco is open now and features an extensive menu including tacos, burritos, quesadillas, salads, enchiladas, fajitas, chimichangas, and more than 14 different types of margaritas. Legends Outlets is the first and only area location for El Toro Loco, which occupies a 6,700-square-foot freestanding building at 1706 Village West Parkway, Kansas City, Kansas – just south of Fuddruckers between Arthur Bryant’s and Chili’s. El Toro Loco has two other locations under different ownership in Memphis, Tennessee. El Toro Loco joins the diverse dining and entertainment options at Legends Outlets including Jazz A Louisiana Kitchen, STIX, Chiusano’s Brick Oven Pizzeria, Yard House, Granite City, Jose Pepper’s, Fuddruckers, Dave & Buster’s, The Dapper Doughnut, Pizza Studio, sweetFrog, and more. For more information, please call El Toro Loco at (913) 400-3050 or visit them on Facebook at www.facebook.com/torolocolegends/. Located in the heart of Village West, the state of Kansas’ top tourist destination, Legends Outlets Kansas City is the only outlet shopping destination serving the greater metropolitan region. Conveniently situated at the intersection of Interstate 435 and Parallel Parkway, just north of Interstate 70 in Kansas City, Kansas, Legends Outlets is the home to more than 75 leading designer and favorite brand-name stores including Coach, Banana Republic Factory Store, Gap Factory, J.Crew | crewcuts, Nike Factory Store, Polo Ralph Lauren Factory Store, Tommy Hilfiger Outlet, Victoria’s Secret, Under Armour® Factory House and Vans Outlet, among many more, which offer savings of up to 65 percent off regular retail prices. Also featuring a wide array of restaurant and entertainment venues, the property welcomes more than 10 million guests annually. The center is open Monday through Saturday from 10 a.m. to 9 p.m., and Sunday from 11 a.m. to 6 p.m. with some venues open extended hours. 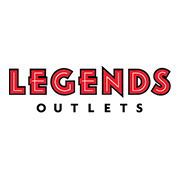 To learn more about Legends Outlets Kansas City, visit LegendsShopping.com or call (913) 788-3700. “Like” Legends Outlets on Facebook (facebook.com/LegendsOutlets), follow on Twitter (@LegendsShopping) and follow on Instagram (@LegendsOutlets).